During their latest visit to Lithuania, Jurate, Lucy and Augie Kazickas visited Alytus region Miroslavas high school and participated at the foundation's "Youth Can" program's practice. School's student and program's participant Egle Zilinskaite shares gratitude and few thoughts from that day. Miroslavas ,,Sporto panos“ (Sport Girls) were a part of historical moment on November 6th. ,,Youth Can“ founders: Dr. Joseph Peter Kazickas' daughter Jurate, daughter in law Lucy and grandson Augie, met us at school's gym. We welcomed them cheering with excitement. We were a bit reluctant in the beginning, but program coordinator Arminas changed that mood with exercises that got everyone participating. Each and every one of us got a chance to show which exercises we prefer, few of us even got to lead the games. After the warm up we sat in a circle and started chatting. The Kazickases shared what they do in America, what they see as "Youth Can" true mission. We shared our points of view, talked how it changed and benefited us. 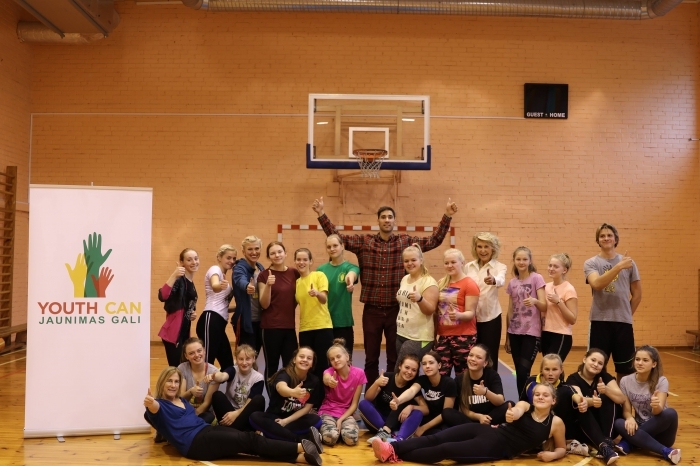 Together we remembered the event in Kedainiai where we got to show off our basketball skills. During the meeting we discussed that "Youth Can" program is not just a sports program. It teaches to interact, trust others, improve, dream big, believe in ourselves, and, of course, it is the best motivation for young people! Our day ended with the introduction to new sport - ultimate frisbee. We were intrigued by it because we've never played anything like it. It was such a fun and lovely day! We thank entire "Youth Can" team and looking forward to future meeting! Ig class student Egle Žilinskaite"